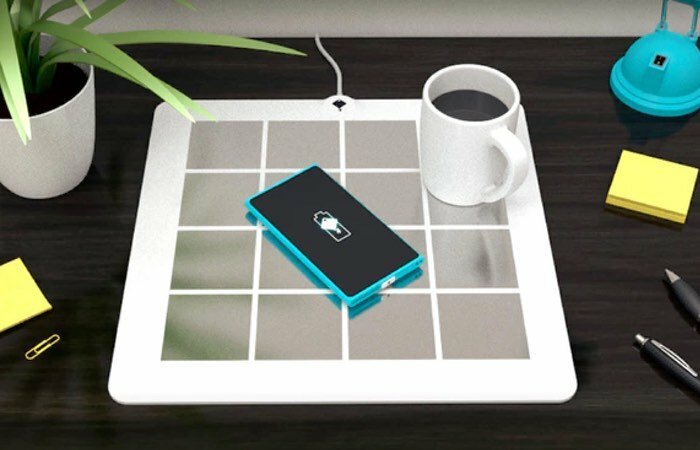 If you are in the market for a large wireless charger to keep your smart phones and tablets topped up with juice, you may be interested in Energysquare which supports simultaneous charging of multiple devices. Unlike other wireless charges the Energysquare does not use induction but offers a new generation of wireless charging technology. Check out the video below to learn more. Energysquare is a new generation of wireless chargers that will allow you to charge multiple devices at the same speed than classic chargers, just by placing it on an ultra-thin pad. No induction, no electromagnetic waves, we are using our own patented conductive charging technology! Install a small sticker on your phone, put it on the pad, and its charging! – A charging pad made of conductive squares inlaid into an insulating material. Each square is then controlled independently by our embedded system. – A thin and adhesive sticker that you can plug into the device and stick to its back. There are two conductive dots on the sticker, which directly connect to the battery.